But as the Bulls were preparing to play the Brooklyn Nets Monday, Noah was one of the big stories of the NBA after Sunday’s nationally televised win over the Knicks when Noah dominated with one of the great triple-doubles for a big man ever, 13 points, 12 rebounds and 14 assists. Suddenly, instead of talking about Noah maybe making an All-Star team, which he now has as a reserve the last two seasons, high level NBA observers are wondering just how good Noah can be. TNT broadcaster Steve Kerr on Sirius NBA radio Monday said Noah could be the third best player in the NBA. Sure, no one is saying Noah is better than LeBron James or Kevin Durant. But if you are picking your team now, whom would you select after them? Would you take Dwight Howard over Noah? A few seasons ago for sure. But now? Consider the top players in the NBA and those likely to be among the top five in NBA voting: Chris Paul, Kevin Love, Blake Griffin, LaMarcus Aldridge, Stephen Curry, James Harden, Paul George and Carmelo Anthony. Are you absolutely certain you’d want one of them over Noah? Noah’s helped do so for the Bulls, who came into Monday’s game with a league best 21 wins since January 1st and second to the Pacers at 21-8. 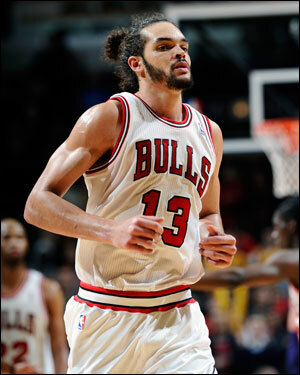 Noah is averaging 12.1 points, 11.5 rebounds and 4.7 assists for the season. — Noah has double digit rebounds in 28 of his last 31 games and in leading the team in assists is on pace to be the first to do so since David Robinson in 1993-94. Noah suffered an ankle sprain in Sunday’s game. But Thibodeau said Noah is playing Monday and has few after effects. “More importantly is what he is doing for the team,” said Thibodeau. “Anytime you get somebody who can pass the way he’s been passing, what it does it makes everyone else better. When you have the skill set of a big who can play away from the basket and create easy offense it’s a big plus. “There’s a lot of things he’s doing just as well,” said Thibodeau. “He’s having a terrific season. Each year he’s gotten better; he strives for improvement and he’s not satisfied. And now, surprisingly enough, post season award voters will have some decisions to make they never much expected.